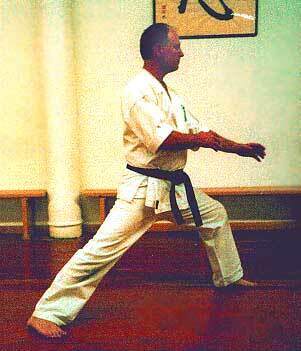 A mistake made by many karate-ka and other martial artists is improper pelvis and hip alignment in their front leaning stance. Instead of the pelvis and hips being aligned naturally under the rest of the spine, the hips are pulled backward and out of line by the back leg. The problem is aggravated if the stance is long and low. When the pelvis is tilted backward and not centered, the spine becomes misaligned and the body's center of gravity is pulled off center. This disrupts power. When the hips are not loose and fluid, power cannot flow efficiently up through the legs into the torso through the hips. And if you practice any of the energy arts, such as Ki Ko (Qi gong or Chi Kung in Chinese), natural flow of Ki energy (Qi or Chi in Chinese) is also restricted by this misalignment. Not only is this inefficient, but it could lead to pain and injury if continued. When done properly, the pelvis and low back should remain in the natural curve as much as possible. But many people when in a front leaning stance allow their pelvis to be pulled backwards by their back leg. This causes a misalignment (collapse into extension) of the spine instead of the spine being integrated and balanced as it maintains its natural curvature. When teachers say "keep the spine straight," this is what they mean. So check your front stance: tuck in your hips and activate your abdominal muscles to help counteract the pull from the back leg. Lengthen and elongate your spine so you are in a position for power and energy to flow more easily. You will feel the difference. So will your body. 1. The person may not have an awareness of the safe position for his or her spine and pelvis. In this case just an understanding of what the neutral curve is for each individual and the importance of maintaining this neutral curve is necessary. When you are standing your "tallest" and "with ease," your spine is usually in its "neutral" curve. Many people have been misinformed that is necessary to always tuck under the pelvis, and flatten this curve whatever position they are in. It is necessary to activate the posterior hip muscles AND abdominals only as much as is needed to maintain a neutral curve of the lumbar spine. 3. The person may need to activate the gluts and abdominal muscles more effectively to keep the pelvis and lumbar spine stabilized. This is what is emphasized most often, but if flexibility is also present, then the lines of energy are more available. The hips are truly loose and fluid and the power and energy will flow more readily. Editors note: Trisha Jenkyns is also very knowledgeable in Yoga. She was a long time Tae Kwon Do practitioner and former teacher of that art at the University of New York at Buffalo. She was one of the finest teachers and technicians of the art I have ever known. Her unique mix of professional and martial arts knowledge gives her a unique prospective that can be educational for all of us. Director of the Alexander Technique for New York. The Alexander technique, which focuses on the understanding and development of efficient body mechanics, is a useful tool to help identify and correct a number of common bad habits with the front leaning stance. One of these is the prime focus of this examination - excessively arching the back and jamming the legs and pelvis into one another, which is often also combined with straining the neck and compressing the head back and down onto the spinal column -- all which combine to create a substantial functional inefficiency and structural strain. In addition students often shift their weight too far forward onto the front leg or, overcompensating, push the head and chest up and too far back, causing rigidity and eventually injuring the knee, back or hip joint. If the head can lead the body into balanced length and expansion instead of fixed contraction, as described below, it results in greater ease and effectiveness. This is the lesson of Alexander Technique and is commonly referred to as "primary control." The Alexander Technique looks at the effectiveness of how our bodies are used. F.M. Alexander discovered that a certain relationship of the head, neck and back resulted in a more efficient coordination of the muscular-skeletal system. The goal is to inhibit those habits that interfere with the freedom of our natural design through awareness and mental direction. This is very different from trying to muscularly manipulate the body to conform to preconceived ideas of alignment or posture that can, among other things, lead to compression of the body. Ideally in a correct front leaning stance, as in any practical body mechanics, the primary control is activated when the pelvis and legs are organized by the traditional Alexander directions; to let the neck be free, to send the head forward and up, to lengthen and widen the back and to aim the legs away from the pelvis.) This initiates an integration of the whole body rather than the manipulation of different parts, and it enables the muscles to function closer to their intended natural length which reduces compression on the various joints. 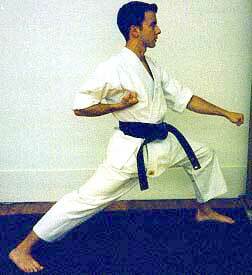 In karate this is the intention of "straightening" the back. The back is not forced or over straightened. Instead, the natural curves of the spine are coordinated both naturally and efficiently. When employed in the front leaning stance, the energy and weight will be up, off and centered over the legs allowing for more mobility and power to come from our center, an important principle in most martial art disciplines. There will be less downward pressure on the lower back, hip joints and knees reducing the risk of strain and injury. There will be an integrated balance and fluidity available to all our techniques. Most importantly, however, we will learn to pay attention to our overall coordination or use, so that patterns of repetitive misuse will not persist to a point of self-inflicted pain and injury which would rob us of the benefits and joy of these wonderful martial disciplines. So often there are issues of inflexibility of certain muscle groups that cause imbalance. This is so often a result of habits and repetitive activities in our daily life such as long term sitting or other occupational situations. Encouraging right direction rather than right position leads to an integrated support by the musculature. Paying attention to the way we use our bodies can contribute greatly to enhanced performance of any kind. The Alexander Technique directions work through a process of indirect procedures that address a state of total coordination or use of self, not specific problems. From this foundation we can achieve the greatest effect with the least effort in all our activities.